If you're red carpet regular who likes his menswear slim fitting and ready for the spotlight, you'll love the latest young man style dinner jackets from Tazio. These slim fit fancy dinner jackets have exactly the red carpet look that you need to be seen wearing on awards night. 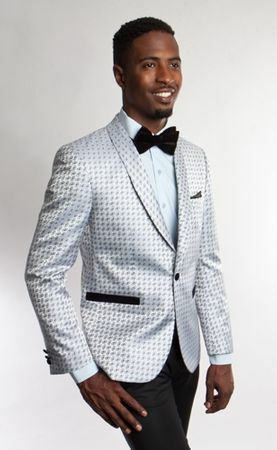 This silver with blue dinner style jacket features side vents and has that fancy pattern fabric that just plain works.